I've been having such trouble with video the past few days. Tried HD sent it back, tried another HD, returned that. Last night my husband said, "why don't you try the regular camcorder" and it worked great. Check out my latest video. Make sure to click on watch in high quality it is so much better. Like I said I got the video to look good, but now the volume isn't loud enough. Need a new Microphone. This card would be great as a wedding, birthday, or a shower card. 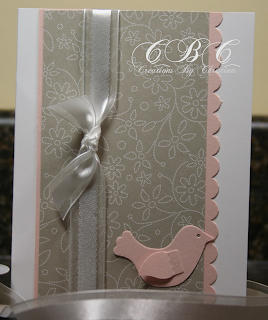 I used the Birds in Bloom Sizzix die, whisper white cardstock. blush blossom cardstock, designer paper from the sale-a-bration catalog, whisper white organza ribbon and the scallop edge punch.